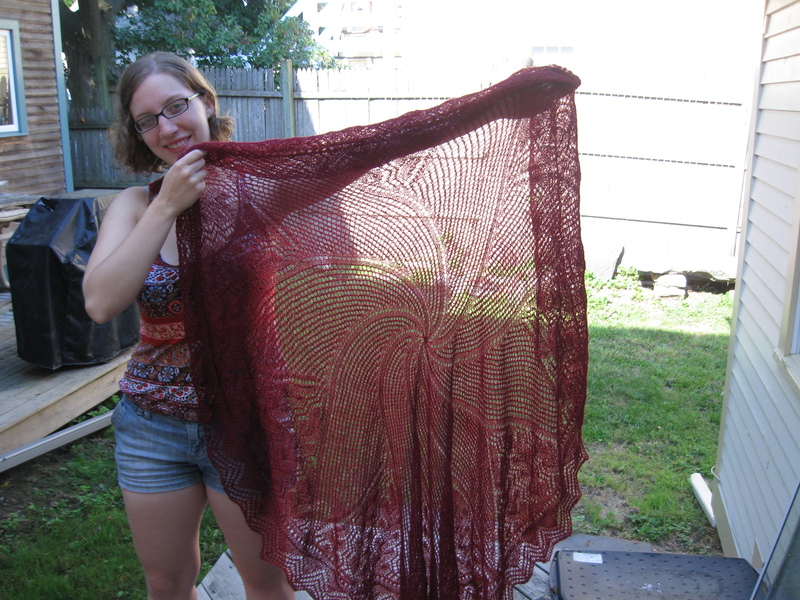 Well, the shawl is done, and here are the photos! I am planning to enter it into the Champlain Valley Fair – please let me know what you think! all of the laundry I’ve been neglecting…blocking is more fun! There is an oft-discussed phenomenon when someone is buying a house known as buyer’s remorse, which is when a person buys a house, gets super excited, and then, upon moving in, discovers a million things he/she does not like about it. The upstairs bathroom sink is drippy, there’s mold in the attic, you can clearly hear the neighbors doing things you’d really rather not have to think about….etc. Whatever the reasons, all of a sudden you are thinking that maybe buying this house wasn’t such a great idea after all. 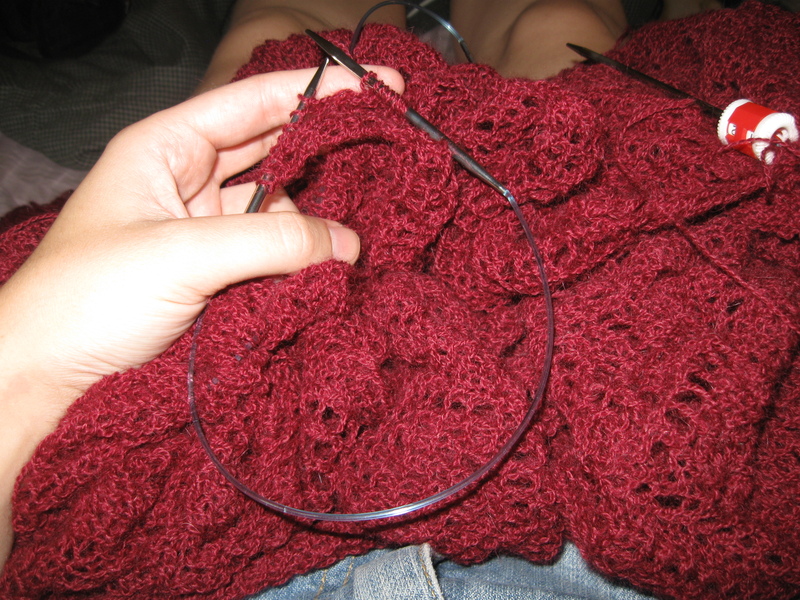 I contend that there is a similar phenomenon experienced by knitters, and I’m going to tell you about mine. 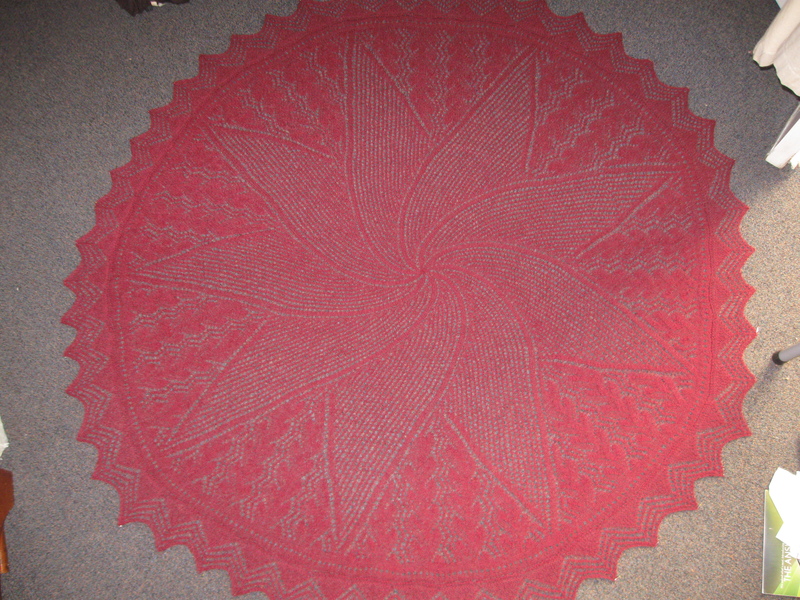 I just finished a shawl that I have been working on for three years now. And by ‘working on for three years’, I mean, of course, ‘working on for five months, losing for two years, then working on for two months.’ Obviously. So a few nights ago, there I was at 1am on a work night, racing the clock to get this thing off the needles so I could go to bed. Finally – FINALLY – I knit the last, wonderful, beautiful stitch (pictured below), and I fell into bed, utterly content and pleased with myself. The shawl was wonderful. Perfect, even. 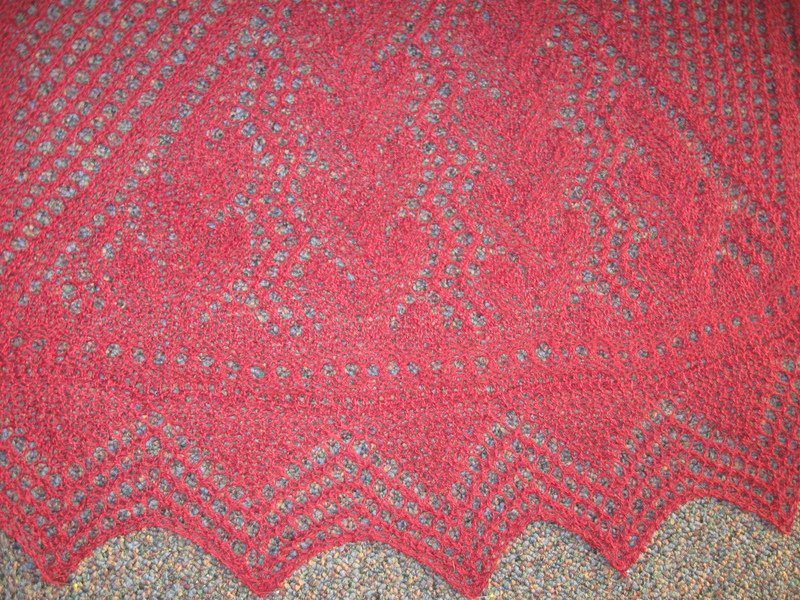 I needed to weave in the ends and block it, and then it would be the nicest shawl you’ve ever seen. Until last night. Last night, Brandon got home from his bi-weekly commute to Massachusetts at around 11:00pm, and was ready to drop from sleepiness. 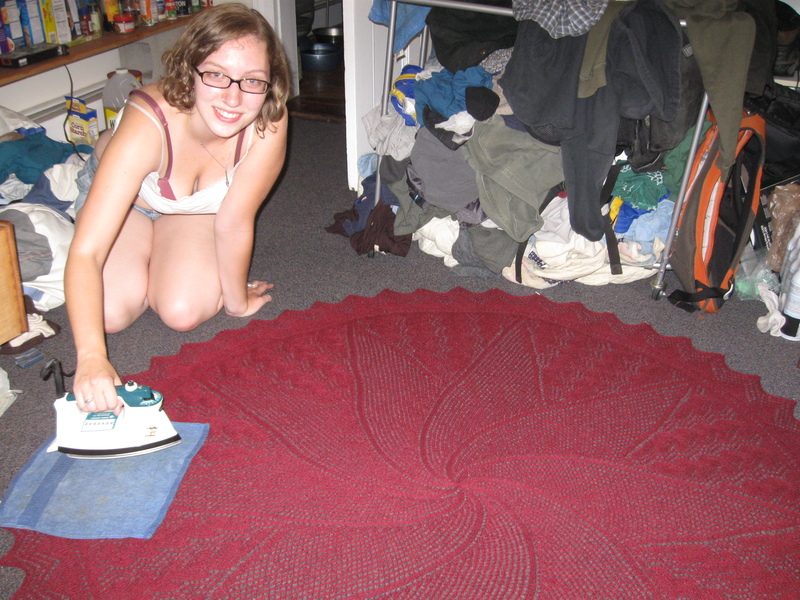 Before we turned in, I asked him excitedly, “do you want to see the shawl? !” to which he very kindly replied, “of course I do!” So I got out the little plastic shopping bag I had it in (what else?) and held it up for him to see. It was the first time I had held it up and looked at it since finishing it, and then I had been delirious with tiredness. The second I let it hang from my arms, I knew something was wrong. “No, it doesn’t.” I said. He looked confused. “No, it isn’t.” I folded it up and put it back in the bag. “Wha…?” Brandon’s confusion was not difficult to miss. I flopped onto the bed next to him. “I used the wrong yarn!” I wailed. Brandon’s eyes bugged out in sudden fear. “I used ALPACA. I knew I should have used mohair like the pattern suggested, but I was too cheap and I used ALPACA, and now it’s not going to keep its shape! Didn’t you see how it stretched down from my hands where I held it up, instead of staying firm?” At this, Brandon utilized the only sensible course of action left to him. He rolled up a magazine and whacked me on the hip. 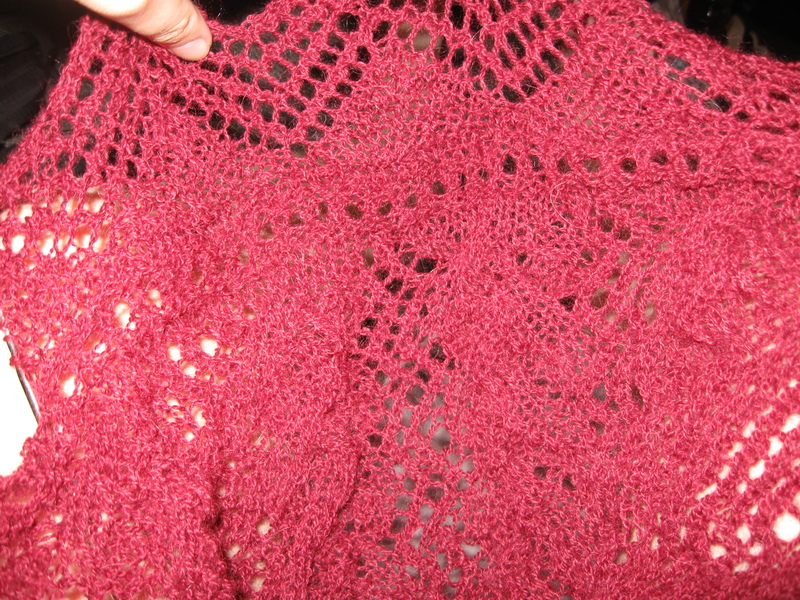 I’m mortified by my mistake and afraid the shawl is going to hang terribly after it’s blocked. My only hope is that the hot iron will shock it into staying stiff, but I know it’s useless. I’ve decided I’m going to enter it into the Champlain Valley Fair – the big country fair of the Burlington area – but I know with that one mistake I haven’t got a hope of winning a ribbon. Next time, I will choose quality over my wallet! I am hoping to have pics up by tomorrow or Friday – I’m a little behind on homework, so thank you for your patience!